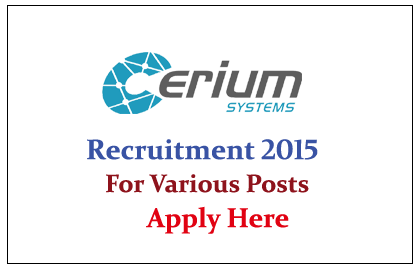 Cerium System Pvt Ltd is recruiting for the various posts for the year 2015. Interested and Eligible candidate can apply here on or before 25th May 2015. Cerium Systems is an ASIC, FPGA and Embedded Systems design solutions Company. With strong domain expertise in Networking, Telecom and defence areas Cerium is the preferred partner for top semiconductor and systems companies. With highest priority to quality and meticulous execution Cerium promises to deliver the best in the industry. Eligible candidates can apply on or before 25.05.2015. For more details kindly Check Official Notification.